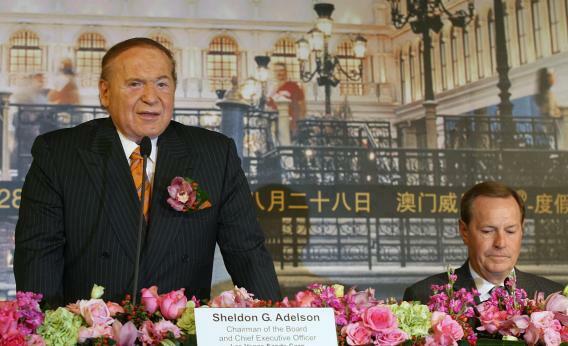 Sheldon G Adelson, chairman and CEO of the Las Vegas Sands (L) and William Weidner president and CEO of Las Vegas Sands Corporation, attend a press conference at the Venetian resort in Macau, 28 August 2007. The Venetian Macao, the world’s biggest casino by gaming tables, opens to the public in an attempt to trump its rivals not only as a gambling paradise but an entertainment centre. Mitt Romney has been trying to connect with workers by suggesting he’ll get tough on trade with China in TV ads and speeches. On a conference call with reporters just now, Obama advisor David Axelrod and fundraiser Leo Hindery, Jr. made the case that Romney isn’t credible on the issue because his Super PAC, Restore Our Future, is getting massive financial support from Sheldon Adelson. Democrats love to raise the specter of foreign or dirty money in campaigns, presumably because they think it helps them reach blue collar workers alienated by globalization and trade deals like NAFTA. Though this approach did not work to great effect during the 2010 midterms, when Dems accused the GOP of the benefiting from donations from foreign corporations, branding John McCain as the candidate of “Big Oil” was central to their strategy at this stage of the 2008 race. If Democrats can use some of Romney’s more colorful billionaire backers against him, the GOP’s advantage in Super PAC fundraising won’t come without a price.